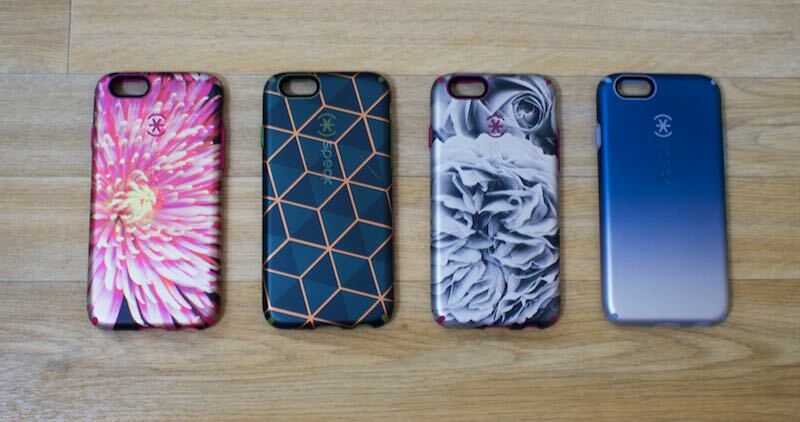 Popular iPhone case maker Speck today debuted a new set of cases in its CandyShell lineup, the Inked Luxury Edition. Like other CandyShell cases, Speck's Inked Luxury Edition cases offer a dual-layer design that combines a rigid plastic outer shell with a rubber interior to offer protection from drops without a huge amount of additional bulk. We were able to check out the Inked Luxury Edition cases in person ahead of launch. They're quite similar to Speck's existing Inked CandyShell cases, but the designs incorporate metallic colors. There are eight different designs available, ranging from floral to geometric, and the designs wrap all the way around the cases. Design wise, there's a lot of variety to suit different tastes. According to Speck, the Luxury Edition cases underwent a "highly technical" printing process that ensures the patterns on the case are resistant to fading and scratching. Speck has also had a third-party test the cases to make sure the metallic finish would not interfere with signal strength. For those unfamiliar with the CandyShell cases, they're not quite as thin as the Apple leather and silicone cases, so they do add some bulk to the iPhone 6 and 6 Plus. The cases are in no way minimal, but they don't add as much extra weight and size as something like an Otterbox case. For those who don't mind cases, the CandyShell is a solid compromise between protection and bulk. CandyShell cases offer protection for the volume and power buttons in the form of rubber covers, and there's a rubber lip that extends up over the edges of the phone to protect the display when it's placed face down on a surface. The case is also thick enough that it protects the protruding camera in the back. The CandyShell Inked Luxury Edition cases are available today from the Speck website and in Best Buy stores across the United States. The iPhone 6 version is available for $49.95, while the iPhone 6 Plus version is available for $54.95. Speck's site is currently offering orders through Best Buy at 25 percent off, bringing pricing down to $37.49 and $41.24 respectively. I buy my cases for protection but wish I could run around naked all day, but I'm constantly moving around. The cases in this post are way overpriced and for that one can get an otterbox or a lifeproof. They have these in stock at Best Buy and on sale as mentioned. They have a matte finish that is a little more grippy than the regular plastic. As long as the colors stay and don't scratch, it will be a good option. Saw these listed on Best Buy's website about a week ago. Speck didn't even have them listed on their own website so I thought it was just more inked Candyshell cases and Best Buy just got the name wrong. It'd be better if their giant logo didn't cover the design.